A pigmented variant of lichen planus (LP) was first reported from India in 1974 by Bhutani et al. who coined the term LP pigmentosus (LPP) to give a descriptive nomenclature to it. LP has a number of variants, one of which is LPP. This disease has also later been reported from the Middle East, Latin America, Korea, and Japan, especially in people with darker skin. It has an insidious onset. Initially, small, black or brown macules appear on sun-exposed areas. They later merge to form large hyperpigmented patches. The disease principally affects the sun-exposed areas of the body such as the face, trunk, and upper extremities. The oral mucosa may rarely be involved. However, the palms, soles, and nails are not affected. Histologically, the epidermis is atrophic along with vacuolar degeneration of basal cell layer. The dermis exhibits incontinence of pigment with scattered melanophages and a sparse follicular or perivascular infiltrate. There is a considerable similarity in histopathological findings between LPP and erythema dyschromicum perstans. However, there are immunologic and clinical differences between the two. These observations have led to a controversy regarding the identity of the two entities. While some dermatologists consider them to be the same, others have opined that the two should be considered as distinctly different diseases. A number of associations such as hepatitis C virus infection, frontal fibrosing alopecia, acrokeratosis of Bazex and nephrotic syndrome have been reported with LPP. A rare variant, LPP inversus, with similar clinical and histopathological findings was reported in 2001. As opposed to LPP, this variant occurs in covered intertriginous locations such as groins and axillae and mostly affects white-skinned persons. The most important differential of Lichen Planus Pigmentosus is Erythema Dyschromicum Perstans. Lichen planus pigmentosus (LPP) was first described by Bhutani et al . in 1974. This disease of unknown etiology runs an insidious and prolonged course and is characterized by macules of dark brown colour distributed principally in the sun-exposed areas of the body. The disease may involve the mucosa but spares the scalp and nails. They named the disease “Lichen planus pigmentosus.” It has been reported to occur predominantly in persons with darker skin and may occasionally be accompanied by pruritus. Cases have been reported from India, Japan, Korea, the Middle East, and Latin America. LPP is essentially a disease of the adult starting insidiously after the age of 30. It occurs in both sexes but shows a female preponderance. It has been reported to occur predominantly in people with darker skin. Although the etiology is essentially unknown, a number of agents have been reported to act as predisposing factors. The occurrence in exposed areas in many patients has led to the proposition that sunlight may be a principal etiological agent. Other postulated agents are hepatitis C virus, mustard oil which contains the potential photosensitizer allyl thiocyanate, amla oil where photosensitivity may be caused by fragrances, cosmetic agents such as kumkum, hair dyes, etc.,, Abnormalities in T-lymphocyte functions have also been implicated. Both LP and LPP have been known to be induced by gold therapy. 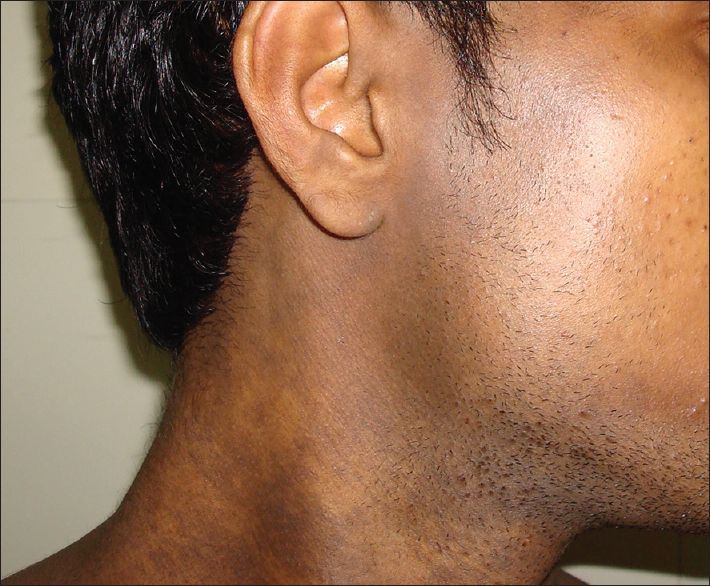 The disease usually starts on the face and neck [Figure 1] and [Figure 2], spreading later to the upper extremities and trunk [Figure 3]. Relatively rare sites of involvement are the oral mucosa and folds such as axillae, inframammary areas and groin. The initial lesions are small, brown, oval macules with diffuse borders. Later, they merge to form pigmented areas which are gray or brown. The pigmentation may be diffuse, reticulate, blotchy, or perifollicular. The patches are usually symmetrical in distribution but may be found in a segmental, zosteriform, or blaschkoid pattern.,,,, LP lesions may rarely occur concomitantly with LPP. However, in LPP, pruritus, the hallmark of LP is almost imperceptible. Wickham's striae are usually absent. The most important variant of LPP is LPP inversus. This entity was first reported by Pock et al . in 2001 from the Czech republic. About 27 cases have been reported thereafter.,,, The disease, in contrast to LPP has been found to occur in non-sun-exposed skin particularly in the flexures, skin folds, and other intertriginous areas. The axillae are involved in 90% of cases [Table 1]. Linear or annular configuration with their long axis following lines of cleavage may be seen in a few of the larger lesions. In 10% of cases, other types of LP including LPP are seen. Although earlier LPP inversus was thought to affect Caucasians only, similar cases have also been reported in Asians and Africans., The histology is similar to that of LPP. A number of other variants such as localized LPP (on thigh), segmental LPP, linear LPP: LPP in zosteriform distribution;, LPP along Lines of Blaschko More Details , and LPP of oral mucosa  have been reported. The disease is characterized histologically by vacuolar degeneration of the basal cell layer with pigment incontinence and keratinocyte apoptosis. 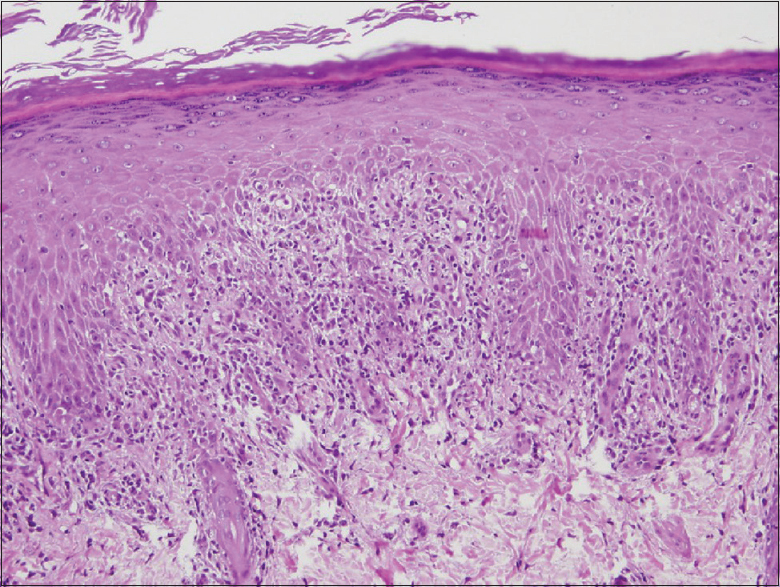 A mild epidermal atrophy with a basket-weave pattern of hyperkeratosis may be present in some cases. The dermis shows a lichenoid infiltrate (band-like lymphohistiocytic inflammatory infiltrate); incontinence of melanin with scattered melanophages [Figure 4]. Based on these histological features, it was suggested that LPP exhibits a lichenoid reaction similar to LP. However, Kanwar et al ., in 2003, reported a mild perivascular infiltrate in contrast to a band-like infiltrate. According to Al-Mutairi and El-Khalawany, the histological pattern varies according to the age of the lesions – while the newer lesions exhibit a band-like infiltrate, the older lesions are characterized by a perivascular infiltrate. The direct immunofluorescence (DIF) pattern also differed in the two studies. Kanwar et al . found that in 14.3% of cases there was a linear deposition of IgM or C3 in the basement membrane zone. Al-Mutairi and El-Khalawany, however, reported that in 16.7% of cases in the papillary dermis there was a globular deposition of IgM., Based on the similarity of DIF studies in LP and LPP, a correlation in the immunopathogenesis of the two diseases has been postulated. There may also be CD1a expression in epidermis and upper dermis along with the predominance of CD8+. Some observers have also noted the presence of IgA and IgG in epidermal cells, the presence of C3 and fibrinogen in blood vessels and clusters of fluorescent bodies in the upper dermis. LPP has been reported to be associated with scarring alopecia and circulating antinuclear antibodies; frontal fibrosing alopecia; acrokeratosis of Bazex and head and neck carcinoma (paraneoplastic LPP); hepatitis C infection, and nephrotic syndrome. Erythema dyschromicum perstans (EDP) is considered as the principal differential diagnosis of LPP. Other differentials are fixed drug eruption, macular amyloidosis, urticaria-pigmentosa, tar melanosis, frictional melanosis, berloque dermatitis, pigmented cosmetic dermatitis (Reihl's melanosis), postinflammatory hyperpigmentation, and idiopathic eruptive macular pigmentation and hyperpigmentation due to drugs and heavy metals. A number of diseases clinically and histologically similar to LPP have been reported in the literature during the last eight decades. Although various names have been assigned to them, it is not clear whether they are the manifestations of the same disease. Gougerot in 1935 perhaps published the first report of a lichenoid disorder similar to LPP when he described a disease to which he ascribed the name “Lichen atypiquesou invisibles pigmentosus.” Two decades later in 1956 Desai and Marquis described cases which showed generalized mottled grey or bluish-black pigmentation with lesions of LP elsewhere which they named “Lichen planus pigmentosus sine Lichen.” In the same year, a disease similar to LPP both clinically and histologically which was named “Lichen pigmentosus” was described by Shima. The very next year in 1957 Ramirez reported a condition which they named ashy dermatosis. In 1961, Convit et al . reported five cases similar to that reported by Ramirez. but with erythematous borders. They named this disease “Erythema dyschromicum perstans.” Sulzberger proposed the name though he was not one of the authors. In 1968, Knox and thereafter in 1973, Pinkus reported a few cases of EDP. The histological features in these cases were very similar to that of LPP., Finally, in 1974, it was Bhutani et al . who first described the disease under the nomenclature of “Lichen Planus Pigmentosus.” These cases were quite similar to those of Ramirez. However, Bhutani et al . noted that in a number of their patient's lesions of LP were present in addition to the macular pigmentation. Hence, based on the observation of this association with LP, they proposed that LPP was a variant of LP with macular manifestations. Degos et al . in 1978 described a disease which they called “Idiopathic eruptive macular pigmentation.” In their series, three patients had lesions which were similar to ashy dermatosis and four patients had postinflammatory pigmentation. However, interface dermatitis was absent in all these cases. Naidorf and Cohen in 1982 proposed that LPP may be the erythema dyschromicum variant of LP. On the contrary, Bhutani et al . in 1986 suggested that EDP should be considered as the macular variant of LP. However, in 1992 Vega et al . expressed the opinion that LPP and EDP were basically two different entities since they had considerable clinical and histopathological differences., In 1996, Kanwar et al ., coined a term lichen dyschromicum perstans to describe a hyperpigmentary disorder similar to LPP without any associated lesions of LP. The controversy regarding the relationship of EDP vis-a-vis LPP rages on even to this day. The two diseases are still considered as different entities by some workers. Pittelkow and Daoud in 2008 opined that “LPP bears significant similarity to ashy dermatosis or EDP and may represent overlap in the phenotypic spectrum of lichenoid inflammation in darkly pigmented skim, with ethnic and genetic factors influencing the expression of disease.” Zaynoun et al . in 2008 attempted to resolve the controversy by classifying ashy dermatosis clinically. According to their classification, ashy dermatosis may be classified into (a) ashy dermatosis: Patients with idiopathic eruptive hyperpigmented macules, irrespective of the presence or absence of interface dermatitis histologically at the time of examination. (b) EDP: Patients with lesions similar to those of ashy dermatosis, but who have or have had lesions with erythematous borders (c) simulators: (i) LPP and actinic LP (ii) postinflammatory hyperpigmentation (iii) drug-induced melanodermas (iv) mastocytosis. 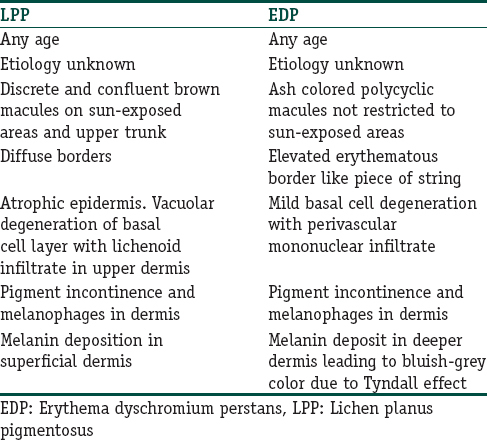 As per this classification like EDP, LPP is also an ashy dermatosis though the two diseases are different. LPP is a disease which is basically recalcitrant to treatment and therapies attempted in this disorder are quite ineffective. Vitamin A was recommended by Bhutani et al . for the treatment of LPP. Other workers have claimed that topical and systemic corticosteroids clear the lesions rapidly  Al-Mutairi and El-Khalawany et al . found tacrolimus ointment (0.1%) to be effective in 53.8% of patients. A few cases have responded well to pigment laser., Sehgal et al . suggested a combination of oral diamino-diphenyl-sulfone (dapsone) along with oral immunomodulator, topical tacrolimus along with photoprotection for the treatment of LPP. 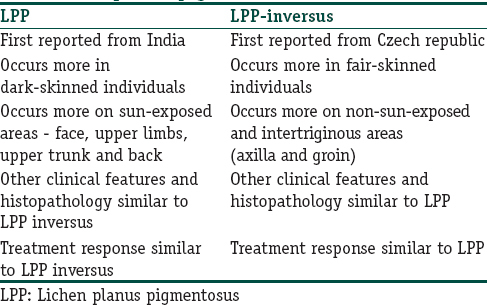 LPP a hyperpigmentary disorder associated with lesions of LP was first reported from India in 1974 by Bhutani et al . Whether this was the same disorder of acquired hyperpigmentation which had been reported periodically during the previous four decades remains a matter of conjecture. After 1974, a controversy has erupted as to whether LPP and EDP are the same disorder. Zaynoun et al . in 2008 attempted to lay the controversy of the status of LPP to rest by placing the disease within the spectrum of EDP. However, this truce appears to be temporary as evidenced by Chandran and Kumarasinghe's recent proposal of a diagnostic algorithm for diseases of acquired macular hyperpigmentation. Rieder E, Kaplan J, Kamino H, Sanchez M, Pomeranz MK. Lichen planus pigmentosus. Dermatol Online J 2013;19:20713. Kanwar AJ, Dogra S, Handa S, Parsad D, Radotra BD. A study of 124 Indian patients with lichen planus pigmentosus. Clin Exp Dermatol 2003;28:481-5. Vachiramon V, Suchonwanit P, Thadanipon K. Bilateral linear lichen planus pigmentosus associated with hepatitis C virus infection. Case Rep Dermatol 2010;2:169-172. Gupta D, Thappa DM. Dermatoses due to Indian cultural practices. Indian J Dermatol 2015;60:3-12. Ingber A, Weissmann-Katzenelson V, David M, Bialowons M, Feuerman EJ. Lichen planus and lichen planus pigmentosus following gold therapy – Case reports and review of the literature. Z Hautkr 1986;61:315-9. Hong S, Shin JH, Kang HY. Two cases of lichen planus pigmentosus presenting with a linear pattern. J Korean Med Sci 2004;19:152-4. Kumar YH, Babu AR. Segmental lichen planus pigmentosus: An unusual presentation. Indian Dermatol Online J 2014;5:157-9. Cho S, Whang KK. Lichen planus pigmentosus presenting in zosteriform pattern. J Dermatol 1997;24:193-7. Vineet R, Sumit S, Garg VK, Nita K. Lichen planus pigmentosus in linear and zosteriform pattern along the lines of Blaschko. Dermatol Online J 2015;21. pii: 13030/qt4rk2w3rm. Akarsu S, Ilknur T, Özer E, Fetil E. Lichen planus pigmentosus distributed along the lines of Blaschko. Int J Dermatol 2013;52:253-4. Pock L, Jelínková L, Drlík L, Abrhámová S, Vojtechovská S, Sezemská D, et al. Lichen planus pigmentosus-inversus. J Eur Acad Dermatol Venereol 2001;15:452-4. Gaertner E, Elstein W. Lichen planus pigmentosus-inversus: Case report and review of an unusual entity. Dermatol Online J 2012;18:11. Murzaku EC, Bronsnick T, Rao BK. 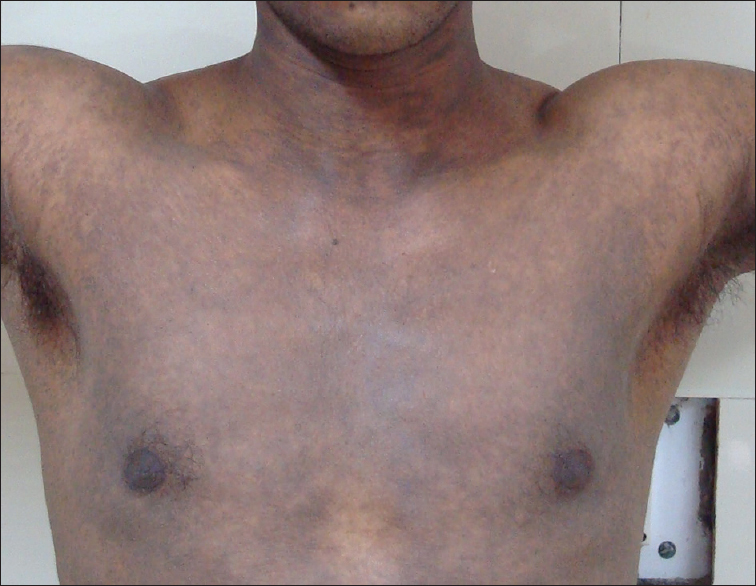 Axillary lichen planus pigmentosus-inversus: Dermoscopic clues of a rare entity. Diagnosis: Lichen planus pigmentosus (LPP). J Am Acad Dermatol 2014;71:e119-20. Ghorbel HH, Badri T, Ben Brahim E, Fenniche S, Benmously R, Mokhtar I. Lichen planus pigmentosus inversus. Indian J Dermatol Venereol Leprol 2014;80:580. Kashima A, Tajiri A, Yamashita A, Asada Y, Setoyama M. Two Japanese cases of lichen planus pigmentosus-inversus. Int J Dermatol 2007;46:740-2. Kim KJ, Bae GY, Choi JH, Sung KJ, Moon KC, Koh JK. A case of localized lichen planus pigmentosus on the thigh. J Dermatol 2002;29:242-3. Laskaris GC, Papavasiliou SS, Bovopoulou OD, Nicolis GD. Lichen planus pigmentosus of the oral mucosa: A rare clinical variety. Dermatologica 1981;162:61-3. Parodi G, Parodi A, Guarrera M, Cannata G, Piccardo G. Lichen pigmentosus with scarring alopecia and circulating antinuclear antibodies. Int J Dermatol 1990;29:227-8. Dlova NC. Frontal fibrosing alopecia and lichen planus pigmentosus: Is there a link? Br J Dermatol 2013;168:439-42. Sassolas B, Zagnoli A, Leroy JP, Guillet G. Lichen planus pigmentosus associated with acrokeratosis of Bazex. Clin Exp Dermatol 1994;19:70-3. Mancuso G, Berdondini RM. Coexistence of lichen planus pigmentosus and minimal change nephrotic syndrome. Eur J Dermatol 2009;19:389-90. Sehgal VN, Srivastava G, Sharma S, Sehgal S, Verma P. Lichenoid tissue reaction/interface dermatitis: Recognition, classification, etiology, and clinicopathological overtones. Indian J Dermatol Venereol Leprol 2011;77:418-29. Gougerot MH. Lichens atypiques ou invisibles pigmentogenes revelie par des pigmentations. Bull Soc Fr Dermatol Syphiligr 1935;42:792-4. [Article in French]. Desai SC, Marquis L. Lichen planus: Clinical study of 67 cases with results of penicillin therapy. Indian J Dermatol Venreol 1956;22:31-48. Shima T. Supplementative study of lichen pigmentosus. Jpn J Dermatol 1956;66:353. Ramirez CO. Los Cenicrentas-Problem Clinico, Report 1st Central American Congress of Dermatology, San Salvador; 1957. Convit J, Kerdel-Vegas F, Rodriguez G. Erythema dyschromicumperstans. A hitherto undescribed skin disease. J Invest Dermatol 1961;36:457-62. Knox JM, Dodge BG, Freeman RG. Erythema dyschromicum perstans. Arch Dermatol 1968;97:262-72. Pinkus H. Lichenoid tissue reactions. A speculative review of the clinical spectrum of epidermal basal cell damage with special reference to erythema dyschromicum perstans. Arch Dermatol 1973;107:840-6. Degos R, Civatte J, Belaïch S. Idiopathic eruptive macular pigmentation (author's transl). Ann Dermatol Venereol 1978;105:177-82. Naidorf KF, Cohen SR. Erythema dyschromicum perstans and lichen planus. Arch Dermatol 1982;118:683-5. Bhutani LK. Ashy dermatosis or lichen planus pigmentosus: What is in a name? Arch Dermatol 1986;122:133. Vega ME, Waxtein L, Arenas R, Hojyo T, Dominguez-Soto L. Ashy dermatosis versus lichen planus pigmentosus: A controversial matter. Int J Dermatol 1992;31:87-8. Vega ME, Waxtein L, Arenas R, Hojyo T, Dominguez-Soto L. Ashy dermatosis and lichen planus pigmentosus: A clinicopathologic study of 31 cases. Int J Dermatol 1992;31:90-4. Kanwar AJ, Dawn G, Dhar S. Lichen dyschromicum perstans. Indian J Dermatol Venereol Leprol 1996;62:213-9. Pittelkow MR, Daoud MS. Lichen Planus. In: Wolff K, Goldsmith AL, Katz SI, Gilchrest BA, Paller AS, Leffell DJ, editors. Fitzpatrick's Dermatology In General Medicine. 7th ed. New York: Mc Graw Hill; 2008. p. 247. Zaynoun S, Rubeiz N, Kibbi AG. Ashy dermatoses – A critical review of the literature and a proposed simplified clinical classification. Int J Dermatol 2008;47:542-4. Kim JE, Won CH, Chang S, Lee MW, Choi JH, Moon KC. Linear lichen planus pigmentosus of the forehead treated by neodymium:yttrium-aluminum-garnet laser and topical tacrolimus. J Dermatol 2012;39:189-91. Han XD, Goh CL. 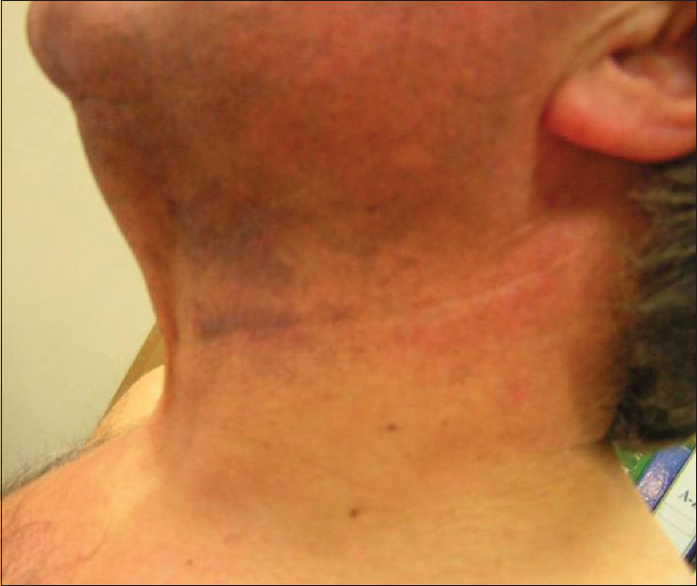 A case of lichen planus pigmentosus that was recalcitrant to topical treatment responding to pigment laser treatment. Dermatol Ther 2014;27:264-7. Chandran V, Kumarasinghe SP. Macular pigmentation of uncertain aetiology revisited: Two case reports and a proposed algorithm for clinical classification. Australas J Dermatol 2016; doi: 10.1111/ajd.12428. [Epub ahead of print]. The relationship between LPP and EDP is a matter of controversy till date.